An unparalleled resource for Scriptural understanding, personal inspiration, and informed teaching and preaching - 29 print volumes! The Ancient Christian Commentary on Scripture does what very few of today's students of the Bible could do for themselves. The vast array of writings from the church fathers—including many that are available only in the ancient languages—have been combed for their comments on Scripture. From these results, scholars with a deep knowledge of the fathers and a heart for the church have hand-selected material for each Bible book, shaping, annotating and introducing it to today's readers. Each portion of commentary has been chosen for its salient insight, its rhetorical power and its faithful representation of the consensual exegesis of the early church. 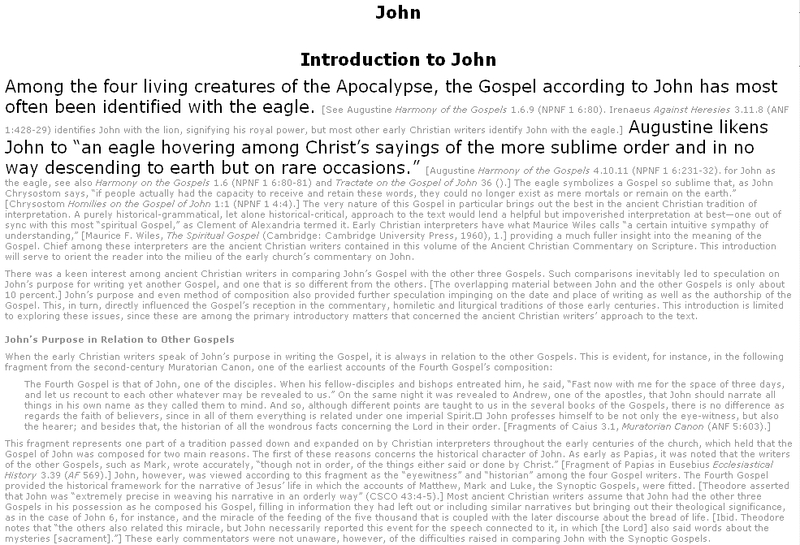 The ACCS includes commentary by the church fathers on all sixty-six books of the Bible and the Apocrypha, and covers the period from Clement of Rome (second century) to John of Damascus (mid-eighth century). Rendering the ancient Greek, Latin, Coptic and Syriac writings in a lucid English translation allows the living voices of the church in its formative centuries to speak as they engage the sacred page of Scripture. The ACCS also includes introductions by world-renowned patristics scholars, and biographical sketches of the ancient writers. 3. Luke, ed. Arthur A. Just Jr. This collection has really helped me understand how the earliest Christians believed and revealed the strength of their faith as found within the words of holy scripture. At First it was hard to read until I realized These were ancient writers interpretation. Once you realize this I suggest Google them so you know who they are. Very resourceful. Helps me to understand the geography, context, and history of the Bible so that I can comprehend and apply it more accurately. I am teaching a class on applying the Minor Prophets to Revelation. Using this commentary as an additional source has helped immensely. This commentary gives me a valuable picture of the thoughts of the Early Church. It motivates me to connect the dots of events and thoughts of the Church Fathers. I have already used this commentary as part of my Sunday School study for Faith Free Will Church on Acts. Although I have 15 other electronic commentaries and 4 hard copy, not included in the electronic, this version contains information not in any of the others. After more use I might be able to upgrade this to a 5 star version but there is more to discover about it before going that far. This looks like it will be a great program. I would probably give it a 5 if I was better at working with e-sword. I still have much to learn about all the possibilities that there is in E-Sword. I have enjoyed using the AC Commentaries , along with some of the other commentaries. I like being able to see what some of the old theologians had to say about the text. I'm just a layman in the church but if I was a pastor, I believe I would refer to these much of the time in my message preparation. I love being able to easily review what Church Fathers have to say about Sacred Scripture. Why so I place so much emphasis on Church Fathers vs. present day theologians? The Church Fathers were 1500 years or more closer to the time Christ walked the earth and gave us God's Word. Not distorted by modernism, society so long demanding that we should soften the Christian Word and so forth. In other words, we have an opportunity to gain from insights that have not been distorted or twisted by current degrading societies. I am not denouncing current theologians -- there are many very good, sound ones. I am saying that I want yet another insight from the times much closed to when Christ was physically with us sharing Divine Revelation. I bought Ancient Christian Commentary for the collection of early church opinions and the price. E-Sword offers the best price I could find for this series of resources. It is good to see that e-Sword is not all about the profit. This has made it more affordable to replace my physical book collection, much of which I have donated to a local Bible college, with digital versions as well as allowed me to expand my collection. It is very handy to have a ready-to-hand collection that embodies the evolution of different opinions about the Old and New Testament among the early church leaders. It highlights the, at times, all too human aspect of Biblical interpretation. Very helpfull in my spiritual growth. The recent revival of interest in the historic interpretation of the Scriptures from the early centuries after its founding, coupled with a growing awareness of the sterility of the excessively critical and analytical "slice and dice" method of much contemporary biblical scholarship, gave rise to this magnificent 29 vol. series. Here you see the loving treatment of the Bible as the book of the Church, to be interpreted and applied by believing minds and hearts by some of Christianity's greatest thinkers and preachers. Until now, one could either shell out more than a $1,000 to purchase the set in paper or obtain it in digital form for up to $385. eStudySource does the Body of Christ a significant service by making such excellent resources available for a fraction of the costs from other sources. The ACCS is a commentary series that is worth its weight in gold! The treasures of the Ancient Church Fathers' comments on the Scriptures are inestimable. I have a library full of books that I use for Bible study and sermon preparation. I am finding that this set of commentaries will always be a part of my research. I like to know what the early church fathers thought about a particular verse. I have been fascinated by the information in this Commentary. Rather than spending a lot of time finding out what the early Church Fathers thought it is at ones finger tips on ever verse practically. I am certainly enjoying my research building sermons. This commentary gives a glimpse into the thinking of the early Church, and also the wonderful scholarship of these men as they lead the Church through troubling times. Truly enjoy reading their thoughts and knowledge of the writings of the scriptures. Have always wanted a source such as this, comments and interpretations from the early Church Fathers, many of whom knew Apostles or others who had seen The Lord Jesus Himself. Their understanding of the works and words of the New Testament writers gives wonderful insight, and this well-edited source provides the information well. Would highly recommend to any Bible student. An excellent commentary and I am sure I will use it a lot - it is useful for understanding the source of some, so called, modern ideas. Many are not really modern at all! Such an amazing work that helps to connect with the thinking of the church in its most broader way: back in history that challenges our modern thought! Very good study tool to have. 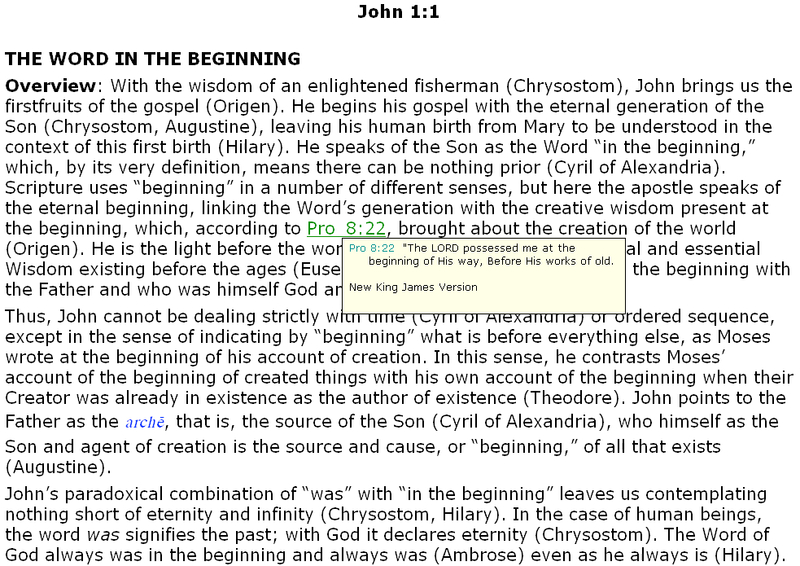 I own 90% of all E-Sword paid modules and must say that the Ancient Christian Commentary is very interesting as it provides comments from different Church Fathers on passages of the Bible. I suppose being penned originally in the Greek they understood the context better than us when it comes to what was implied in the original language. So while it's not an exhaustive verse by verse commentator's view for each Church Father, it does have the necessary mix which is needy for research and good homilies. If you're like me and really need to exegetic every verse when preparing sermons than I highly suggest this. I have all the e-Sword commentaries and the ACCS immediately became the first commentary I look at now when I open a scripture passage. I like it so much I quickly paid $300 for the Logos version for my son. As a minister he is studious and he reported that these commentaries are REALLY good. I will add, that until I started reading from the ACCS, I didn't know Augustine had a sense of humor. Having the Old Testament series in books, it's great to have them all now available at the push of a button on my PC/ipad. 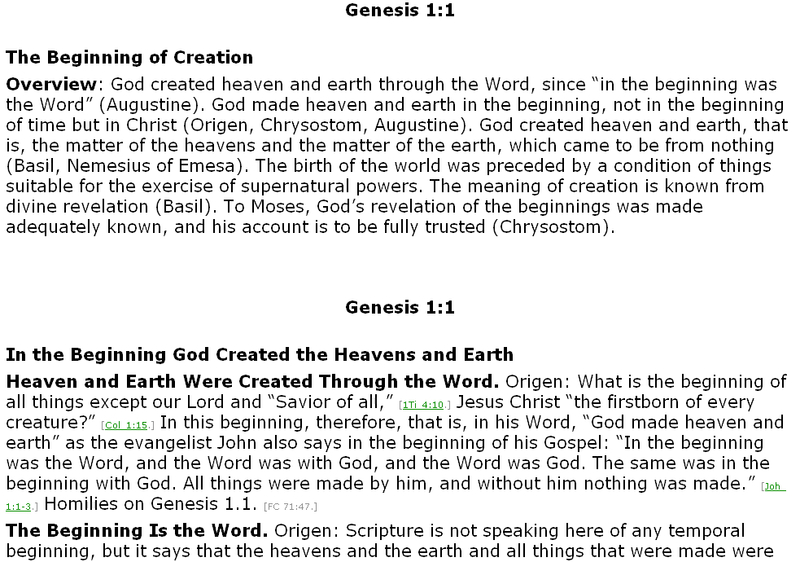 There is a gold mine on what the early Church Fathers said on particular passages. This resource is normally not used in private study or sermon preparation due to the many books required to reference from. Now all are available to allow us to know what was said in the first few hundred years as the early church established itself. This is a priceless addition for anyone wanting to know the mind of the early saints. Don't miss it!